Do I need a drumroll for this? 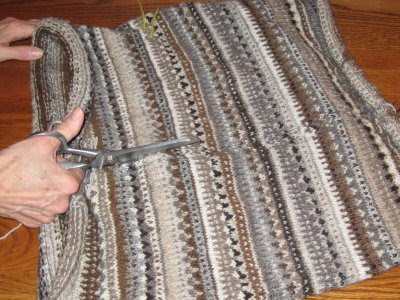 Here are photos of sewing and cutting the neck and front steeks of my Fair Isle Shetland Sampler Cardigan. The first thing I did was to test stitch tension on my sewing machine with a small knitted swatch. When I was satisfied with that, I sewed the actual steeks. I followed the instructions in Peg Arnoldussen's Essential Techniques for Serious Knitters (see my review in this post). 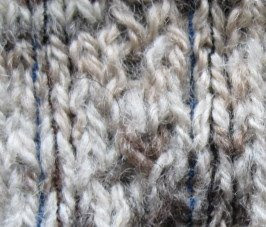 The stitch is straight and small. I think I set my machine at about 20 stitches per inch. 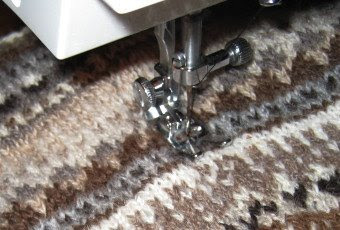 The line of machine stitches had to go either down the middle or between stitches. My front steeks were six stitches wide. For these I sewed three rows of machine stitches on each side. 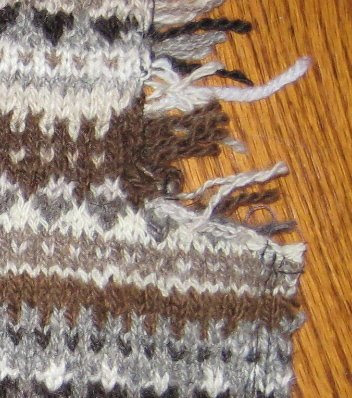 For the wound neck steek (which I actually did first), one row of machine stitches went down the center of the edge stitches, and another along the outside of the edge. Then came the cutting between the stitched lines. It actually wasn't as scary as I thought it would be. I just reminded myself that this is only fabric after all. Here is the left upper front of the cardigan. You can see how both steeks turned out. I'll repeat this process the sleeve openings and my Siamese Sleeves. The next step is to block this piece. Then I'll sew and cut the armhole steeks, stitch the shoulder seams, and then I can begin on the bands! wow, that's a lot of steeks but I suppose that the way the Nordics knit them. I've only done a front steek and it scared me to death but turned out fine. Front and armhole steeks - that's brave. Oh Bettina, if only I could get it finished that fast! Thank you for the added fanfare, Cally! It's much appreciated. It looks pretty scary to me! I can't wait to see the finish sweater. Pleased you should be what a wonderful project! Of course I'm partial to shetland. Thanks so much for the detail shots -- it brings it into the realm of possibilities for me. (Though I still think my hands would tremble!) Congratulations on the steekage! I look forward to seeing it all finished. Bravo! You did it! Isn't it exciting to master something new? And especially something as scary as steeks. I hope some day to follow in your footsteps. Got my eye on a vest pattern that has a stranded border, so only one weeny steek to deal with -- warming up for the tough stuff. Thanks ya'll. I appreciate the support! The only other thing to add is ..... jump on it, the water's fine! Okay, I freaked out when I saw the scissor's pic, actually ran out of the room. Drum Roll, marching band and a few seditives for me!! Although I think you did a great job. I definately won't be doing this, the nerves can't handle it. Great job Leigh. I have been following along rather haphazardly of late. I think the one thing that people don't think through with cutting a steek, is that you are making vertical cut and the stitches can't easily unravel sideways. 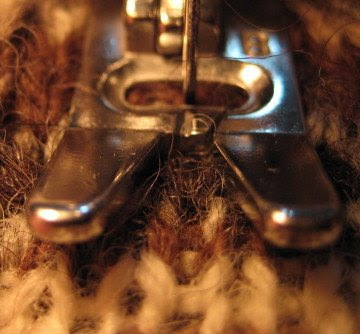 If you were making a horizontal cut through knit fabric, then the time for a moment of panic would be real. Tricia, I find what you say to be true, there is very little tendency for the cut edges to want to unravel. I will have to sew one horizontal line, across the bottom of the sleeve openings. I don't think I actually have to cut horizontally there though. That is going to be a lovely sweater. It's lovely even in pieces! Oh - so wonderful that the weather is perfect for sweaters! I can't wait to see this finished!